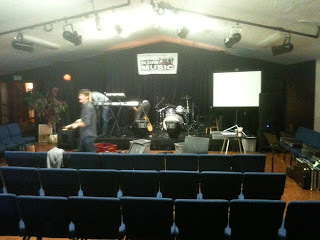 The Drum Set: What are you missing? 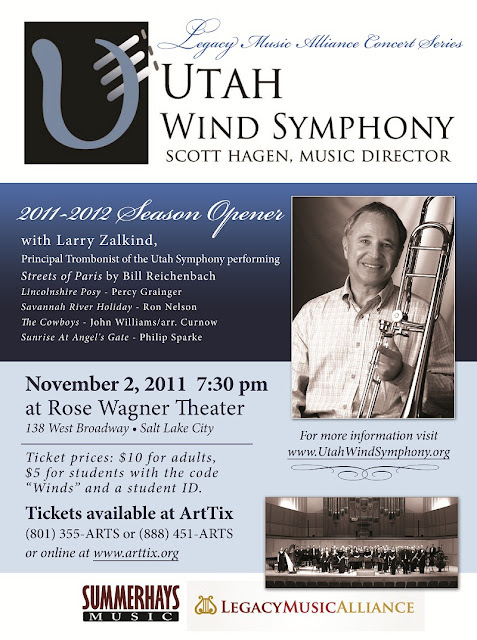 The Utah Wind Symphony is beginning its second season with a concert of epic proportions. It has been a privilege for me to be a part of this group, and I look forward to playing with them for a long time. Please join us on November 2 if you can! On Friday, October 21, Lokalgrown played at the Brigham City Fine Arts Center as part of the "Music in the City" Concert Series. Special thanks to Austin Weyand for inviting us out. 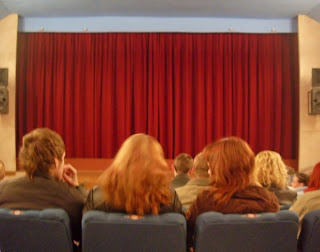 We had a great time - and talk about a friendly audience! I apologize for the bad photos. This was another time that I felt like I just had to shoot a few quick photos. So...here they are! From about 1/3 back in the audience. It's a really small stage, and it's apparent that this building was used for something else before it was converted into a performance venue. Right: A little closer up. Below: Views from the right and left of the kit. The first kit shows my monitor, a Mackie SRM 350. Love those little dudes. Extremely hard working and great sounding. While listening to some jazz on the radio tonight, I heard a song with this in it. Truly random, and I loved it. I've always found it interesting that when we are trying to learn the language of music, we often limit ourselves to one particular dialect. When I moved to the midwest (USA) for a few years, it took me forever to figure out what a 'bubbler' was, and people looked at me funny when I asked for a drinking fountain. But I'm from the mountain west. It's not a bubbler (or is it? ), it's a drinking fountain. So it is with learning a style of music. 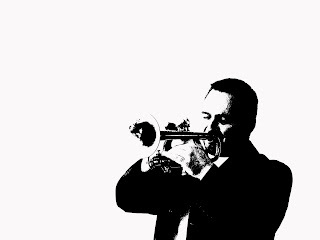 Many of my students are learning jazz, and most of them play jazz at school, but they don't actually know how to speak the language. 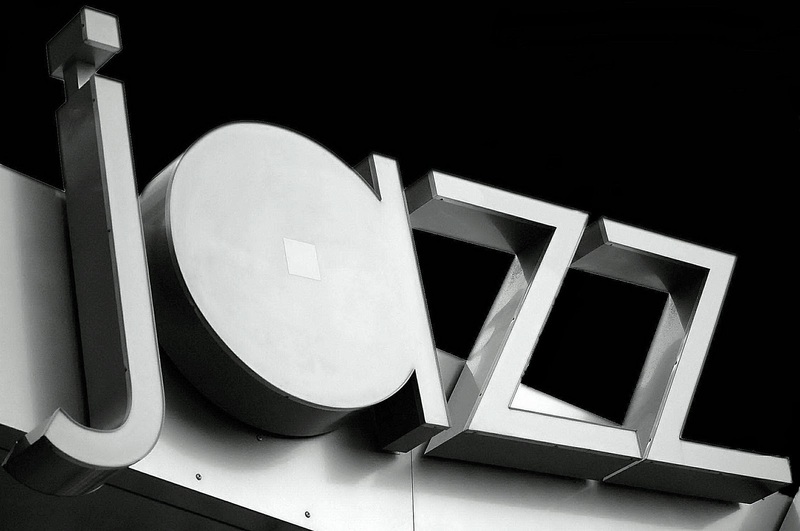 And the biggest reason we don't speak jazz is that we rarely hear it being spoken. What do you hear on the radio at the mall, doctor's office, or grocery store? Usually it is a pop station or what we lovingly refer to as "elevator music." Not a good example of jazz. Again, in mainstream culture, you won't hear jazz. In the Salt Lake City area (and most of Utah, southern Idaho and western Wyoming) you can catch jazz here, on KUER 90.1 FM from 8 PM to 12 AM. 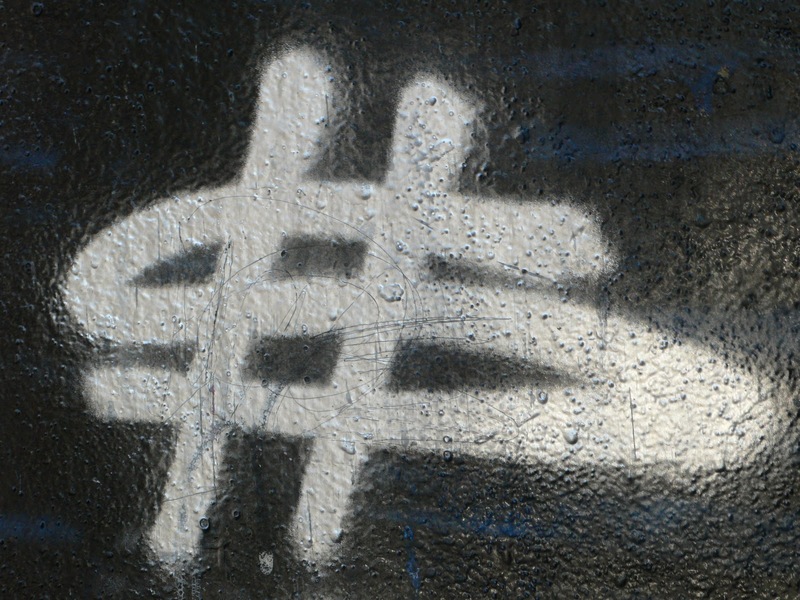 There are also great online resources, such as Pandora, Jango and Grooveshark. When I was in college, a roommate of mine attempted to teach me Spanish. He had some great books and CDs, but also told me that I had to watch daytime television.....in Spanish. Every day. I know it sounds odd, but it didn't take too long before I started to hear the words and phrases I was studying in the TV shows, and my accent improved tremendously. The same is true with jazz - or any other style or genre you want to master. And just like a small child learning to talk, you start by imitating, then you speak with your own voice. In our quest for swing independence, one of the goals is to keep the ride pattern consistent. Try the exercise below and see what it does for your thinking and swinging. Keep the snare, hat and kick all at the same dynamic level at first, then try playing around with some phrasing. Remember, start slow and gradually speed up. Don't play this exercise any faster than you can do it accurately. Once you're feeling comfortable with it, try laying it down with the track below. Go for at least a full minute, and get it really dialed in. Know your price range. Know what drums cost. My most expensive kit would cost somewhere in the range of $8,000 to replace, and there are plenty of kits out there that would be even more. 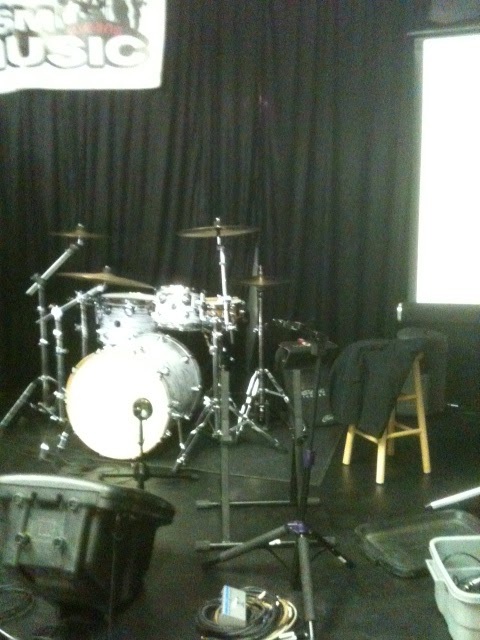 That being said, the kit I have played the most (for just the drums and hardware, no cymbals) was right around $500 new. This will offend 99% of drum makers out there, but if you pay less than about $500 for a "complete" drum set new, you're getting ripped off. Cymbals are their own world, and we'll get to that in another post, but as a baseline, check this out. All the other great advice about taking somebody with you comes into play, too. Don't buy the first kit you look at, wait 24 hours, etc. Feel free to add any words of wisdom in the comments below, and questions are always welcome. Try out this 12/8 groove. It's deceptively simple. 1.The diamond-shaped note heads above the staff are the ride cymbal bell (alternating with hi-hat). 2. Remember that a hi-hat note with an "o" above it is to be played slightly open, but make sure you get it closed for the next note. 3. The note on count 10 (or 4, depending on how you're counting) is the floor tom. 4. 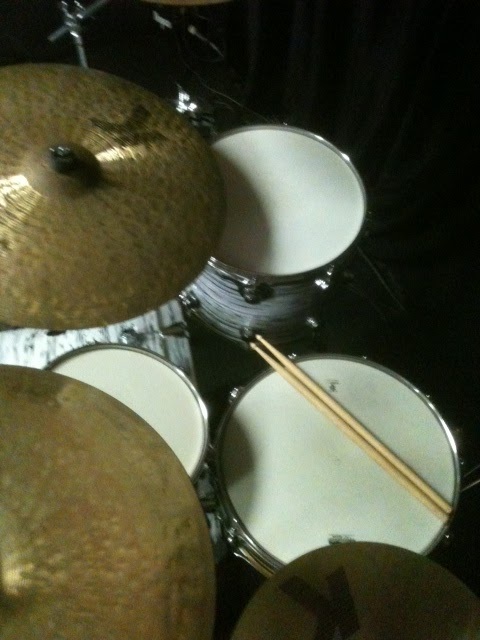 Yep, right hand is moving all over the place while the left stays home on the hi-hat. Here a few more things to think about as you go drum shopping for the first time. If you missed Part 1 of this series, you can find it here. Especially for your first kit, get the best drums you can get. Don't worry too much about cymbals. The more you play and the more you hear, the more your taste in cymbals changes. 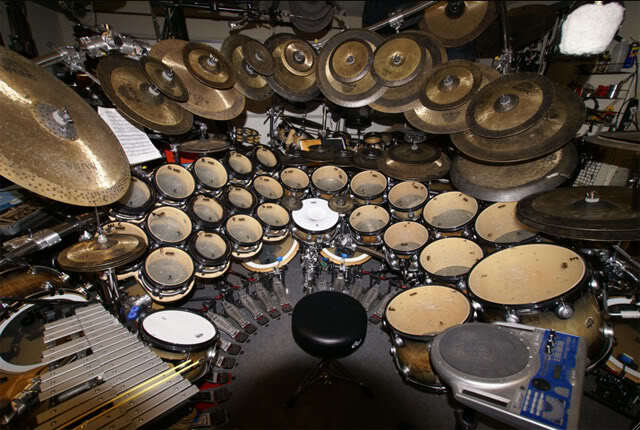 Also, you can get cymbals one by one, but adding an extra drum that matches your kit is potentially very expensive. Think of the heads on the drums like tires on a car. If it's a great car but the tires are worn, you still buy the car - but maybe you negotiate a better price! How many drums and cymbals to buy? You don't have to get crazy. 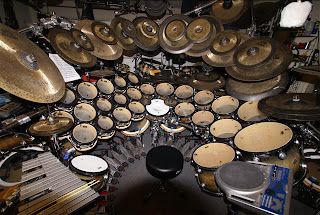 You don't want Terry Bozzio moving in, right? A standard four or five piece kit* is plenty for a beginning player. As for cymbals, you need at least a hi-hat, a ride and a crash. Sometimes you can get a great deal on a set of drums without cymbals (as long as you get the hardware - the stands that hold everything up and together) and then get an inexpensive box-set of cymbals like this. Cymbal companies are getting innovative, though, and if you're looking for a little more bang for your buck, this is an amazing deal for a beginner. * Only actual drums count as "pieces," not cymbals, hardware, sticks, etc. 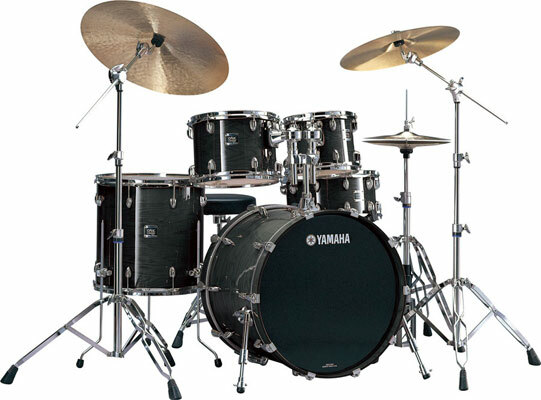 A five-piece kit usually has a bass drum, snare drum and three toms. A four piece has bass, snare and two toms. Here's a great discussion on the complete drum kit. As I mentioned in another post, I have a hard time with "standard" size drum kits. * In my world you choose drum sizes based on functionality and sound, not for style or image, and certainly not because a drum maker said they'd be "perfect for any player." Rack Toms: 12" and 13"
For more information on a what a complete drum kit is, check this great post at www.start-drumming.com. Here's my big issue: not every player is the same size, but there are some physical and ergonomic rules that need to be followed - not only to ensure proper technique and comfort, but also to prevent injury. Consider this - When sitting at the kit with both feet on pedals, the thigh should slope slightly toward the floor from the hip to the knee. The knee should be slightly behind the ankle, but directly over the heel (not to one side or the other). This sitting position puts the shoulders (and thus the elbows, wrists and hands) at a certain height. 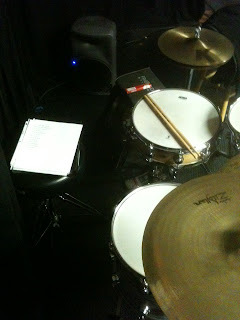 When you put standard sized toms in a correct playing position on top of a standard sized kick (bass drum), the average person simply isn't tall enough to play them without seriously altering their technique, sitting position or playing motion. 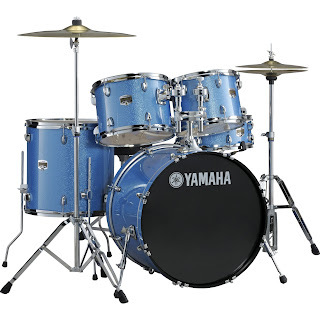 To deal with this issue, most young players will either play with incorrect technique or form, or put the drums into an incorrect awkward position, or both. Imagine a kid on a bike that's obviously way too big or too small. This is an oversimplification of the problem, but you get the idea. 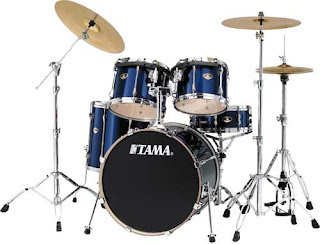 Bottom line - When considering a set of drums, first set them up so that they're ergonomically correct, then sit at the drums at the height you'd have to be at to play them with good technique. If your thighs are more than a little sloped, they're probably too big. *As a disclaimer, I actually own and use all of the above sizes, but never in this configuration. I have no problem with 14" snare drums, although I use 13" hats (standard is 14") about 99% of the time. Lessons now or lessons later? 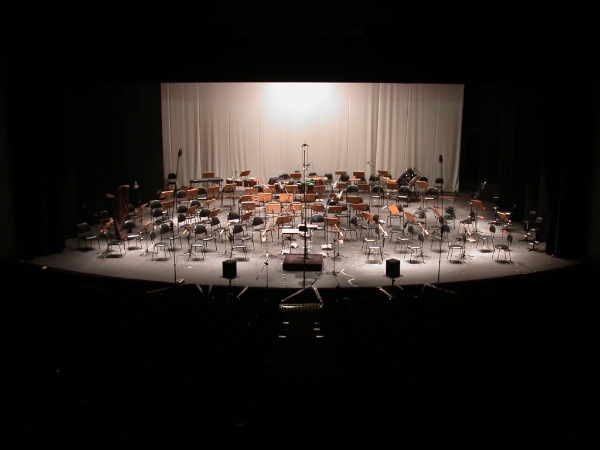 When I worked in a music store, one of the many questions asked was, "Should I take lessons right away, or should I try to figure it out on my own and take some lessons later?" Simply put - is it a waste of time getting lessons when you don't know very much? Shouldn't you just play for a while, figure some things out and then make the most of lessons when you know a few things? Well, let's put it in a different light, shall we? 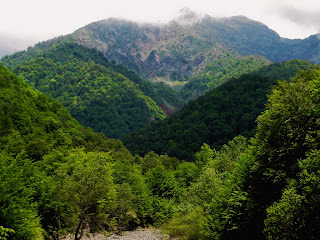 Imagine you want to climb a mountain, a big one, and you point to the top and say, "Hey, why don't I just head that way? I can see the top, it'll be easy." What are the chances you'll get all the way to the top? You might not. 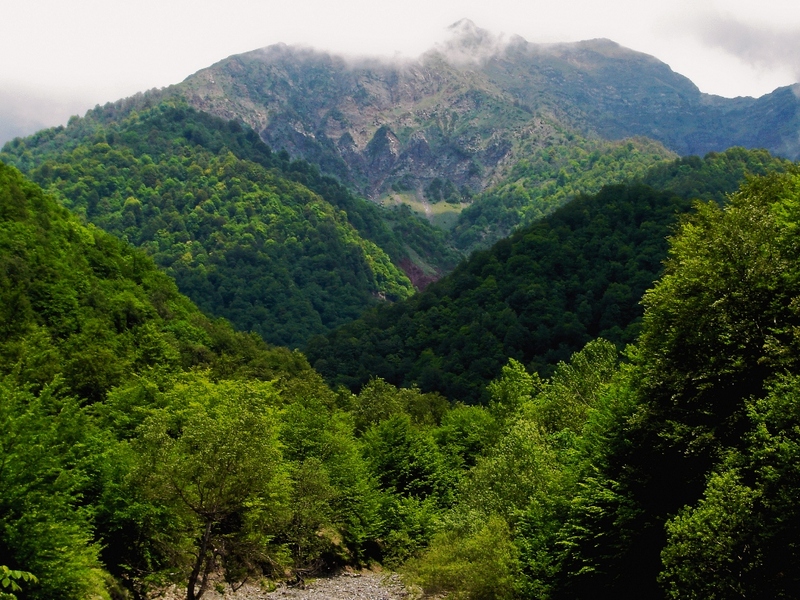 You might run into cliffs, rivers or forests that you can't navigate. Or maybe you'll get there, but it will take a long time and you'll have to back track and change routes many times. Now imagine you take someone with you, somebody who knows the trails and has the map. How much easier and faster will it be to get to the top? Just as in climbing a mountain, having a "guide" to learn to play music can help you get to where you want to go much faster and with fewer problems along the way. Now, I'm not saying that nobody has been successful on their own. Many people have, but almost all of them will tell you they wish they'd had help when they first started. On your journey up the mountain, it's better to have a guide to show you the map and get you on the correct trail right from the beginning. My advice is this: Learn right from the start. The Christmas season is just around the corner, so it's time to talk about getting that first drum set. Before you go on, though, read this post I wrote a while ago. Think about the size of the drums and the size of the drummer or drummer to be. "One size fits all" has been the motto of the entry-level drum world for a long time, and it simply isn't true. For example, I'm 6'1" tall, and a standard size drumset (22" bass drum, 12, 13 and 16 inch toms) is pretty hard for me to set up in a comfortable, ergonomically friendly way because it's just too big. 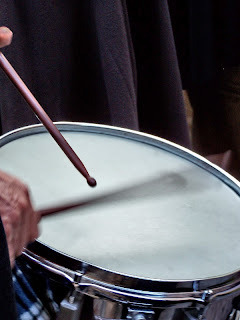 Check out this post for more info about drum size and player size. 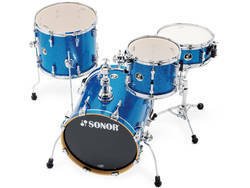 Especially if the player is younger or smaller, make sure to get drums that fit. 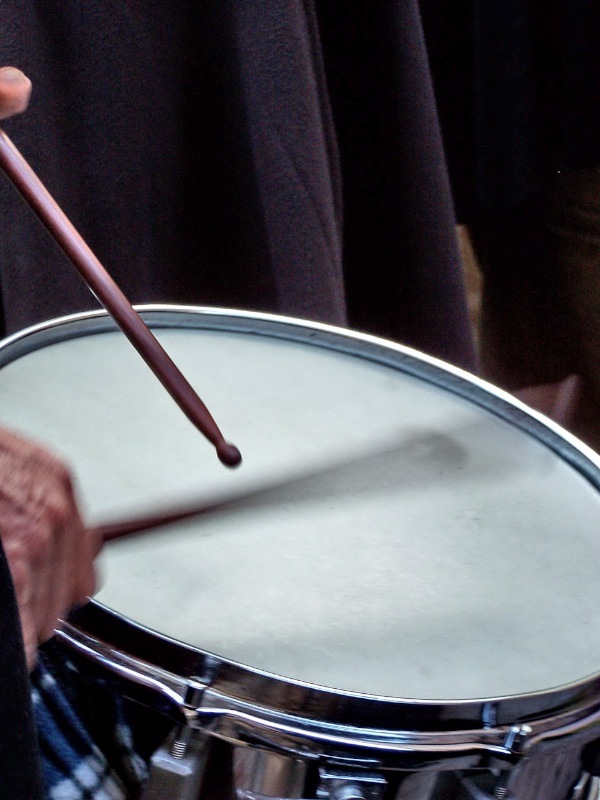 While the sound of the drums will be nominally affected by their size, today's drum makers are making great sounding drums in a variety of sizes. Imagine a pee-wee football player wearing NFL sized pads, helmet and shoes. The equipment won't protect them, and may actually get them hurt if they go out to play in it. Developing good technique and enjoying drumming is a lot easier when the drums are set up right and you can get to everything in a natural, easy way. Consider buying used. Purchasing a new kit can be expensive, but buying used - especially from an individual - is an entirely different story. Once I was able to buy a "bulk lot" of drums and equipment from somebody who was moving and just wanted to get a little quick cash. I paid $225, and as I inventoried and researched the items, what I had purchased was worth well over $1,000. Score! Online sites such as ksl.com and craigslist.com are great places to shop. I'm a little obsessive about it, but I skim online ads a few times per week, and there's always at least one good deal on a drum kit. 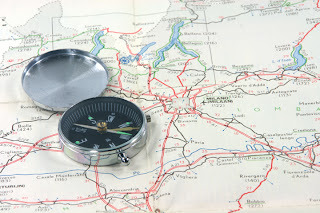 Other sites, like eBay, allow you to list items that are within a certain geographic area, so that you can actually go to pick up the kit (and examine it) after you purchase it. Guitar Center lists used gear on their website, and you can purchase it online and have it shipped to your local store or to your home. In Part 2 we'll discuss how to get the best value for your dollars, and how to decide what's worth buying.